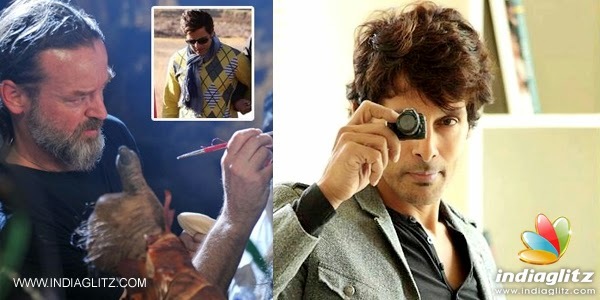 Home » Featured , Latest Buzz » Vikram as Wolf Man in 'Ai'? Vikram as Wolf Man in 'Ai'? There isn’t a day passing without any surprises from team ‘Ai’, the latest one is, the producer has revealed that; Vikram has undergone lots of trouble to sport the look of a Wolf Man. In order to sport this look, Vikram has put on 50+ kgs and shed 70kgs later to finish the rest of the portions. The picture of Wolf Man was already on the net, but the picture does not reveal the face of Vikram. It shows the left wrist and the makeup man is busy doing his work. Now, after the press meet of Aascar Ravichandran we are getting some sort of idea about the look and the photo which is already doing its rounds. Su Ba, the dialogue writer for ‘Ai’ has posted saying, the letter ‘Ai’ carries different meanings such as, King, Leader, Soft, Beauty, Teacher, and Poison. If we go by the synonym of the letter ‘Ai’, the story could be a mixture of all the above and the movie buffs will be assured of a feast!